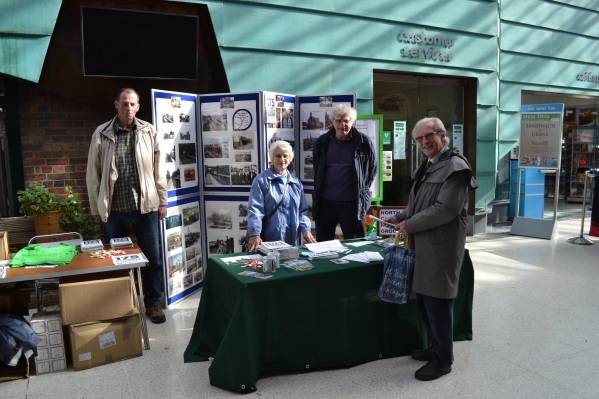 Our images show Committee Members, Tom Welsh, Pauline Jenkinson and Bob Florence at the NCRUG display distributing all sorts of goodies with a visitor enjoying the display. Many passengers were taking an interest in our wares. Free mugs, postcards and booklets were available together with book marks and "Bags for life" courtesy of "itravelsmart" ( www.itravelsmart.co.uk ). One member tried out "Fancy Dress" as a member of 1950's footplate crew with cotton overalls and grease top cap and attracted much attention from locomotive crews who had worked on steam in the late fifties' s and early sixties. 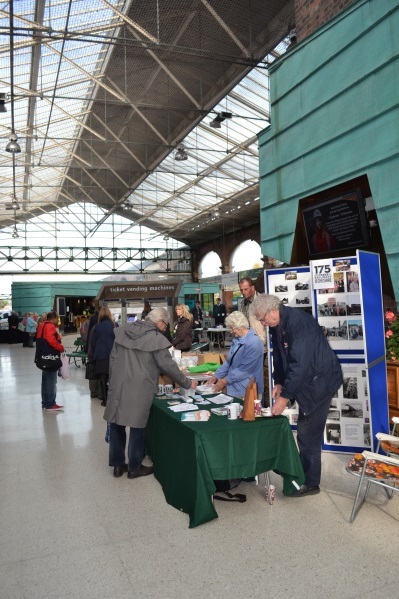 Drivers from Chester, Wrexham and Llandudno Junction were encouraged to tell tales, of daring do, from that time and many smoke rings were generated above the station concourse! Many thanks to Arriva Trains Wales (ATW) for providing the facilities and Sally Buttifant of Cheshire West and Chester Council for organizing and coordinating the event without whom it would not have happened.